Catherine Malabou, Antonio Negri, John D. Caputo, Bruno Bosteels, Mark C. Taylor, and Slavoj Zizek join seven others-including William Desmond, Katrin Pahl, Adrian Johnston, Edith Wyschogrod, and Thomas A.
Lewis-to apply Hegel's thought to twenty-first-century philosophy, politics, and religion. 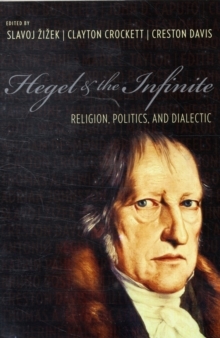 Doing away with claims that the evolution of thought and history is at an end, these thinkers safeguard Hegel's innovations against irrelevance and, importantly, reset the distinction of secular and sacred. These original contributions focus on Hegelian analysis and the transformative value of the philosopher's thought in relation to our current "turn to religion." Malabou develops Hegel's motif of confession in relation to forgiveness; Negri writes of Hegel's philosophy of right; Caputo reaffirms the radical theology made possible by Hegel; and Bosteels critiques fashionable readings of the philosopher and argues against the reducibility of his dialectic. Taylor reclaims Hegel's absolute as a process of infinite restlessness, and Zizek revisits the religious implications of Hegel's concept of letting go. Mirroring the philosopher's own trajectory, these essays progress dialectically through politics, theology, art, literature, philosophy, and science, traversing cutting-edge theoretical discourse and illuminating the ways in which Hegel inhabits them.